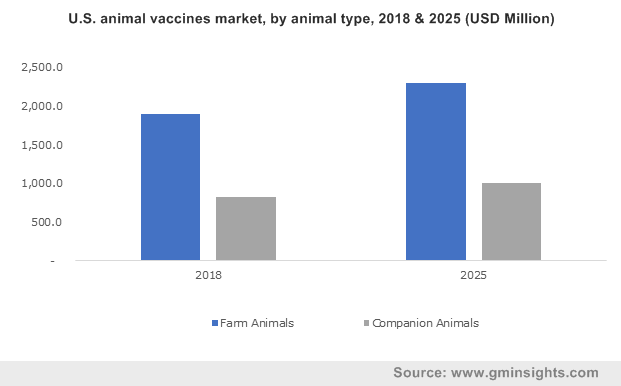 Animal Vaccines Market size was valued at USD 6.8 billion in 2018 and is expected to witness more than 4.3% CAGR from 2019 to 2025. Number of pet animal adoption for companionship has increased significantly in past decade. There were around 7 million pet animals in India in 2006 which has grown to 10 million in 2014. Growing social acceptance of pets has stimulated pet adoption. Increasing disposable income is considerably spend on pet care. Growing number of smartphone applications that enables locating veterinaries, pet grooming and pet accessory stores has positively impacted market growth and will continue to augment industry growth during the projected timeframe. Favorable government initiatives will drive global animal vaccines market over the forecast period. U.S government launched “Feed the Future” initiative through which it provided training to public as well as private animal health workers for development of animal vaccines system. The objective were to establish breeding programs and generating business opportunities for privately held animal farms in the U.S. There have been several private and government organizations worldwide working to stimulate growth of animal vaccines sector along with reduction in animal derived human infections, thereby favoring industry growth. Farm animals’ market is expected to reach USD 6,509.6 million by 2025. The need to increase production of farm animal products such as milk, beef, eggs etc. is the major factor for farm animal vaccines market growth. Population boom will result in an increased requirement of animals for food, thus contributing to the global animal vaccines market. This trend is expected to propel the demand for therapies and innovative technologies for improving product efficiency, thereby fostering segmental growth. Companion animals market will grow at 3.7% CAGR during the forecast timeframe owing to growing social acceptance of pet animals. Companion animals such as cats and dogs play a significant role in the lives of people. The bond between animals and human has escalated the demand for animal products, including vaccines and pharmaceuticals, which in turn contributes significantly to the health and wellbeing of animals. The trend of having animals as companions is on the rise and will accelerate companion animal vaccines industry growth in the future. Live attenuated vaccines business is estimated to reach USD 4,125.9 million by 2025. Rapidly spreading public awareness programs in developed countries for animal health is one of the major factors propelling market growth. Moreover, various advantages associated with live attenuated vaccines such as rapid, long-lasting immunity and reduction of booster dose administration will foster business growth. Growing disease burden and increasing animal healthcare investments will favor segmental growth in the future. Recombinant vaccines market will expand with a remarkable rate of 5.2% CAGR during the forecast timeframe. The segmental growth is attributable to increasing government initiatives for using recombinant vaccines in developed economies for various bacterial and viral diseases. For instance, WHO provides numerous funding programs for development of recombinant vaccines. Moreover, various advantages associated with recombinant vaccines will favour market growth in the upcoming period. Viral vaccines business accounted for largest revenue of USD 3,792.4 million in 2018. Business growth is attributable to rising number of viral infections in animals across the globe. For instance, as per study published in Journal of Veterinary Science & Technology, Newcastle disease, a viral infectious disease is widespread in Asia, and Africa, affecting majority of poultry farming. Increasing prevalence of viral veterinary diseases across the globe will favor business growth. Bacterial vaccines market will grow at a significant rate of 4.2% CAGR across the forecast timeframe. Increasing prevalence of several infectious and non-infectious diseases such as leptospirosis in canines are projected to drive the bacterial vaccines market during the forecast period. For instance, as per the study published in British Medical Journal, in 2013, about 18% of dogs were diagnosed with leptospirosis. High pervasiveness of bacterial infections will foster business growth in the future. 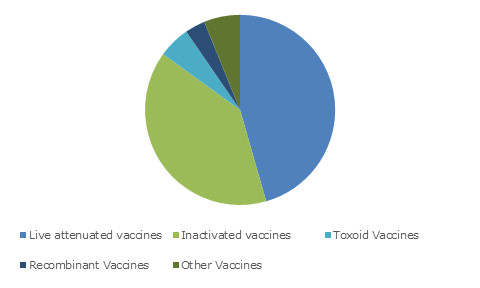 Injection vaccines business is forecasted to reach USD 5,321.8 million by 2025. Injection vaccines have higher efficacy and provide significant and long-lasting immunity to the animals. Moreover, advantages associated with injection vaccines will drive demand for injection vaccines throughout the forecast timeframe. Availability of skilled human resources for administration of injection vaccines in developed countries of North America and Europe will boost market growth. Immersion/spray vaccines market will grow at 4.5% CAGR during the forecast period. Industry growth is attributable to growth of poultry and aquaculture farming. Poultry and aquaculture are the major source of animal food in countries such as China and the U.S. With increasing number of poultry and aquaculture farming, the demand for immersion/spray vaccines is poised to increase in the future. U.S. animal vaccines market is expected to reach 3,298.5 million by 2025. Increasing practices in pet healthcare and intensive animal farming for consumption are main reasons behind the market growth. Steadily growing pet adoption, increasing spending on pet health enabled by high disposable incomes, inventions in personalized pet medicine are some factors driving the pet healthcare market at large. 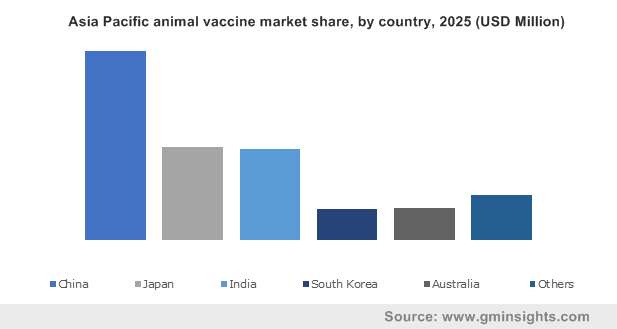 China animal vaccines market is forecasted to expand at a CAGR of 11.0% in the foreseeable future. China’s huge population holds a great appetite for animal source food and as it is expanding steadily, the demand will only increase in future. To meet continuous demand of meat, animal farming strives to produce high volume of healthy animals. The farm animal vaccines products market is strongly driven by this demand and should propel market growth in years to come. 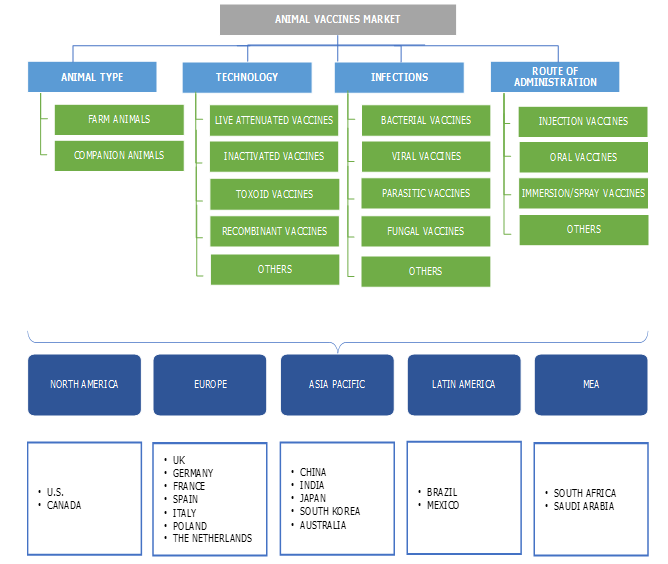 Few of the notable industry players operating in global Animal vaccines market are Boehringer Ingelheim Animal Health, Ceva Sante Animale, Dechra Pharmaceuticals, Durvet, Inc, Elanco, Henry Schein Animal Health, Hipra Animal Health Limited, Merck Animal Health, Neogen Corporation, and Zoetis. These companies are opting strategies such as novel product launch, mergers and acquisitions to foster business in animal vaccines industry. For instance, in October 2016, Merck Animal Health announced the approval for Nobivac Canine Flu Bivalent vaccine by the U.S. Department of Agriculture. Through this approval the new bivalent canine influenza vaccine enabled streamlining protection against the disease and provide veterinarians with a variety of new vaccines and medicines to advance optimal pet care. The use of veterinary vaccines has progressed from an experimental stage to a relatively safe practice. Veterinary vaccines play a significant role in animal and human health protection by reducing the need for antibiotics to treat companion and food animal. Adoption of novel technologies, providing animal models of disease, and confronting new and emerging infectious disease will be of major importance in the future. New technologies such as recombinant DNA technology are used to develop novel and innovative vaccines against diseases and improve traditional vaccines. Majority of market players are exploring new avenues for development of advanced and novel animal vaccines. For instance, the plant made Newcastle disease virus vaccine showed industrial and technical feasibility for application with animals. Although, vaccines are not available for all infections, access to modern research and new techniques for vaccines development holds great promise and opportunity for the future.